By now, you’ve probably heard about Kenn Nesbitt’s new children’s poetry anthology, One Minute Till Bedtime (Little, Brown for Young Readers). It has received numerous positive reviews like THIS ONE and THIS ONE and THIS ONE and was also selected by Publisher’s Weekly as one of the best children’s books of 2016! But this blog tour is a little different; rather than sharing the poem(s) we have included in the book, we are sharing poems that were submitted, but not selected! You see, when Kenn asked us to send him our poems, we had no idea which ones he’d chooses and which ones he’d pass on…so it seemed like a waste not to give those poems that didn’t make the cut their own opportunity to shine. Back on Nov. 4, I shared one of my poems that didn’t make it – and today I have another. This one is a lullaby of sorts that I wrote back in the mid-’90’s, before I was even making an effort to become published, but which I have sung for each of my 4 kids, right before bed. The rhyming isn’t perfect, but they all love it – so to me, it’s perfect the way it is. no more time to eat. If you’d like to check out all the other poems from all the other folks taking part in this blog tour, head on over to Jackie Hosking’s blog and you’ll find several poems and all the links to the other blog posts. 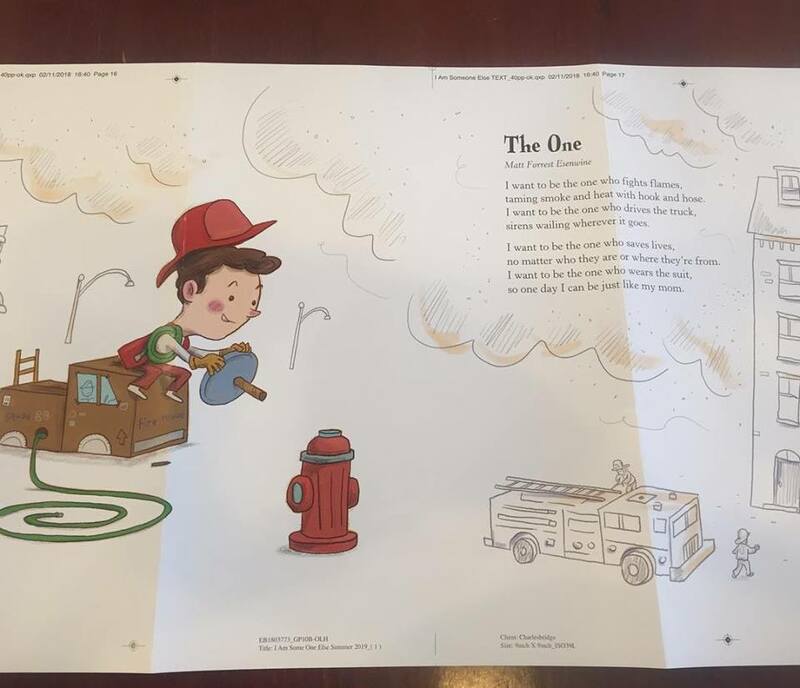 As for Friday itself, that is the day I get to share a new poem with the readers of Penny Parker Klostermann’s blog, as part of her ongoing series, “A Great Nephew and a Great Aunt” – an opportunity for two family members to collaborate on a picture and an accompanying poem. I’ve already had the pleasure of writing poems based on drawings by my two youngest children, and now I get to share a poem I wrote based on something by one of their two older sisters! I hope you’ll take a trip over to Penny’s blog to see it…and be sure to also visit Bridget Magee’s Wee Words for Wee Ones for today’s complete Poetry Friday roundup! If you have spent any amount of time enjoying Poetry Friday, you have probably come across the blog of my friend and fellow writer, Michelle H. Barnes, Today’s Little Ditty. What started out as a forum to share her work soon turned into a showcase of interviews, repository of writing advice, and a community of folks sharing their own work. And today, it becomes a book! I’m very happy to announce the publication of Michelle’s The Best of Today’s Little Ditty, 2014-2015 – a collection of 75 poems by 55 different folks who have visited her site and contributed poetry over the past 2 years. …I write her name in my notebook. even when she’s turned away? I write her name in my notebook. that make a girl smell so nice? Congratulations again, Michelle…on the book, of course, as well as on your blog’s huge success! And speaking of poetry blogs, please stop by Brenda Davis Harsham’s little home on the web, Friendly Fairy Tales, for today’s complete Poetry Friday roundup! 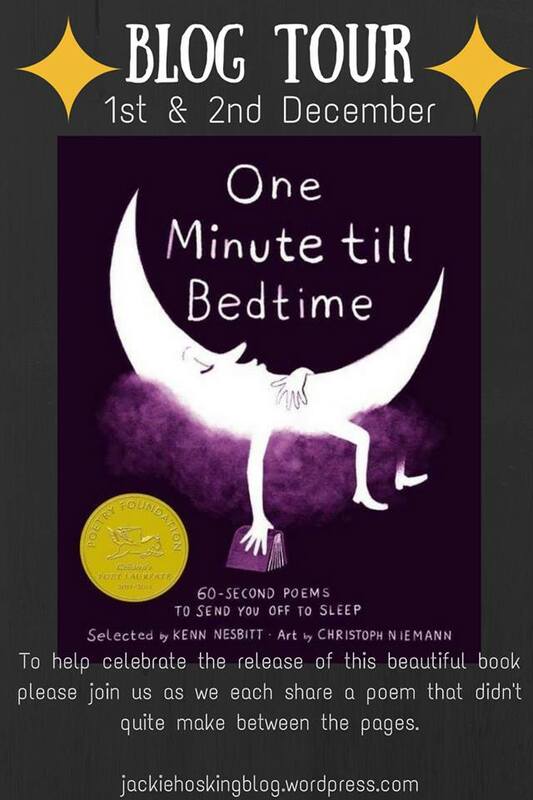 Poetry Friday: “One Minute Till Bedtime” countdown! The book is comprised of short, 60-second(ish) long poems for kids – and parents, too, of course! – to add some poetry to the end of their day, after the kids have been read to and are tucked in bed. Additionally, the illustrations by New York Times illustrator Christoph Niemann are simultaneously dreamlike yet grounded, whimsical yet introspective. 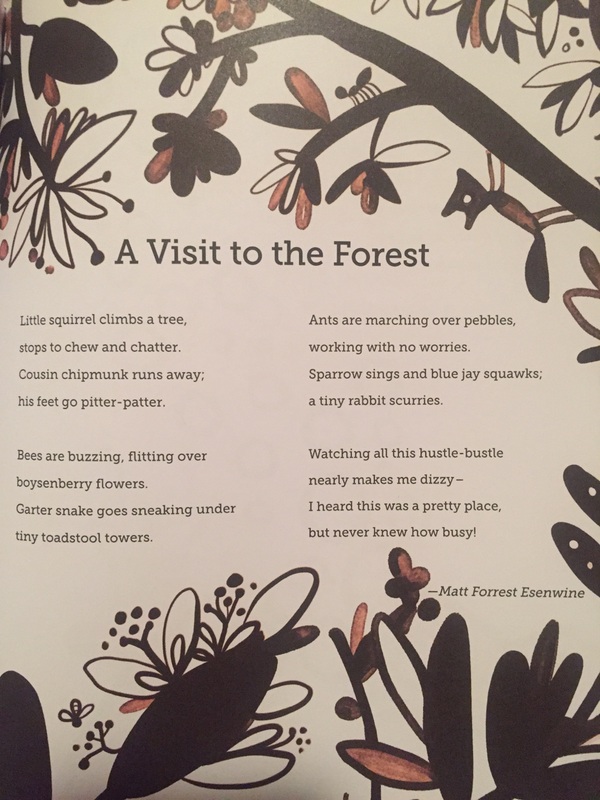 For more poetry links and fun – and a few other samples from inside covers of One Minute Till Bedtime – please visit Linda Baie at Teacher Dance for today’s complete Poetry Friday roundup! The following poem was first published in the anthology Trigger Warning: Poetry Saved My Life (Swimming with Elephants Publications, 2014), and following its publication I shared it here on this blog. Even though I rarely re-post poems, I felt this would be appropriate in this case, in recognition of President Obama’s recent proclamation of June being Lesbian, Gay, Bisexual, and Transgender Pride Month. He had to keep quiet. immolation of love and pain. Jone MacCulloch is hosting Poetry Friday today at Check it Out, so for all of today’s links and fun, be sure to…check it out! Poetry Friday: National Cereal Day! Almost exactly one year ago, the children’s poetry anthology The Poetry Friday Anthology for Celebrations (Pomelo Books) was released. In it, one can find my poem about National Cereal Day, which is coming up on Monday, March 7…so of course, I had to share it with you again! I was quite humbled that Kirkus singled out this poem in their review of the book last year. And if you’d like to see what a 14-year-old student decided to do with the poem, check out Sylvia Vardell’s video HERE – it’s quite fun watching someone recite something that you wrote! I also need to congratulate the winner of a new book! Congratulations, Robyn! I’m sure you’re going to love it. Thanks so much to everyone who stopped by my little corner of the blogosphere and entered the contest. But wait, there’s more! (poetry, that is) For all of today’s Poetry Friday posts, please visit Linda Baie at Teacher Dance! And happy early spring, everyone…don’t forget to turn your clocks ahead next weekend, as Daylight Savings Time begins! Poetry Friday: We missed National Cereal Day! It’s been so crazy around here lately – between book releases, manuscript revisions, and the #MMPoetry March Madness competition – that I completely spaced on this most awesome of holidays! The reason I’m celebrating is because I have a poem included in the newest Poetry Friday Anthology, The Poetry Friday Anthology for Celebrations, which is due out in just a few weeks, and the poem is about National Cereal Day – which was last Saturday, March 7. I have to admit…as much as I try to be healthy, I’m still a kid at heart, so my favourite cereals are the ones I’m not supposed to eat. Lucky Charms, Fruit Loops, and any Monster cereal that I come across are destined for my pantry. And when someone decided to make Lucky Charms with CHOCOLATE and someone else put MARSHMALLOWS in Fruit Loops…well, let me just say I wanted to shake their hands. I’m talking about KaBoom; Quisp; Moonstones; Grins and Smiles and Giggles and Laughs; Q-bert (yes, the video-game hero had his own cereal! ); Oreo-O’s; and the venerable Donutz!! Can I get a holla?!? And yes, that’s Cap’n Crunch’s real name! I don’t make stuff up, you know. I felt I should contribute something connected to my home state (the cereal was developed by a New Hampshire resident), but alas, it didn’t make the cut. And to be honest, I never even really liked Cap’n Crunch when I was young. Even as an 8- or 9-year-old, I knew there was something just plain wrong with the texture. I used to LOVE these…oh, Hoots, wither hast though gonest? So what were YOUR favourite cereals as a kid? Pebbles? Super Sugar Smacks? Honeycomb? (remember Strawberry Honeycomb?) How about those lost classics like King Vitamin, with the creepy-looking dude on the box…or Baron Von RedBerry – a Monster-cereal knockoff that I still wish they’d bring back? I’d love to hear your comments, below. For today’s complete Poetry Friday round-up, please visit Laura Shovan at Author Amok, and please be sure to check out the Madness that is the #MMPoetry competition over at Ed DeCaria’s place, Think Kid, Think! I lost in the first round, but it’s still a lot of fun and the competition continues throughout the month. Be watching for the PFA for Celebrations, and I’ll be sharing more poems that didn’t make it in in the next couple weeks! Poetry Friday: “Dear Tomato” anthology is available now! I am thrilled to be able to finally say I am a published children’s author! Three poems of mine were selected for inclusion in Carol-Ann Hoyte‘s new children’s anthology, Dear Tomato: An International Crop of Food and Agriculture Poems – and it officially went on sale on Amazon this past Monday! Dear Tomato… features over 50 poems by 34 poets from around the globe. The poems vary greatly in form and style – some are structured forms, some are free verse, some are humorous, others are a little more serious – but they all share an agricultural theme. And while Carol-Ann worked at sorting through and editing all the poems, her collaborator, photographer Norie Wasserman, provided the black-and-white photographs that accompany the text. I hope you’ll pick up a copy! Although it’s only available via Amazon right now, it should be more widely available within the next month or two. Laura Purdie Salas’ third and final edition of her “…Can Be…” series, titled A Rock Can Be… (Millbrook Press) comes out this weekend! It hits bookshelves this Sunday, March 1, and you can read my complete review of it HERE. The very first children’s book I was contacted to be part of comes out this Tuesday, March 3! Lullaby & Kisses Sweet is a board book anthology for young children, 0-5 years, and I couldn’t be happier about working with the wonderful and highly esteemed Lee Bennett Hopkins. For Tuesday’s blog post, I’ll be sharing more info about the book, my page from it, and a short interview with Lee – so be sure to stop back then! I also want to let you know about this year’s March Madness Poetry 2015 Competition! Once again, Ed DeCaria at Think Kid, Think has put together this annual friendly event which not only stimulates the minds and creative juices of those of us taking part – but helps to bring a little poetic excitement to the classroom, as well! What’s that? You’d like your classroom to join in the Madness? Then find out more and sign up today! The insanity begins soon, so be sure to follow Ed and his blog on Twitter or Facebook – or just stay close here, as I’ll be providing updates throughout the month! Whew, I’m worn out! That’s it for now. Writer/poet/blogger Heidi Mordhorst is hosting Poetry Friday at her blog, My Juicy Little Universe, so head on over for all of today’s poetic links and info! Jama Rattigan is hosting Poetry Friday today, and if anyone knows how to create a crowd using food, it’s Jama! She has croissants and chocolate and candied rose petals and raspberry-litchi pate and…well, you’ll just have to stop by and try some. Anyway, a couple of weeks ago I announced that a new anthology titled, Trigger Warning: Poetry Saved My Life, had just been made available for sale. I was looking forward to seeing it because I was one of the folks whose poetry had been selected for inclusion…and today, I’ll be sharing that poem here! First, I need to let you know the 9th Annual CYBILS Awards nominations are now OPEN! The CYBILS, as they are called, are the Children’s and Young Adult Bloggers’ Literary Awards, and are announced in February of each year. Two rounds of judges will narrow down all the nominated books for a variety of categories, and will decide which they feel are the best of the best. But before they can whittle down the list…they need a list! That’s where you come in. Just click visit the CYBILS nominations page and let the judges know which of this year’s books for children and young adults you feel deserve some special recognition. As you’ll see, there are lots of categories, from early readers to young adult speculative fiction to my favourite, poetry! So make sure you log on and get your favourite book nominated – and I’ll keep you posted here about what’s happening! Speaking of poetry collections, I just received my copy of Irene Latham’s Dear Wandering Wildebeest: And Other Poems from the Watering Hole yesterday, and it’s as wonderful as I had suspected. Many thanks to Irene as well as to last year’s CYBILS Poetry Award winner, Amy Ludwig VanDerwater for sending it to me – I was lucky enough to be the winner of a giveaway Amy hosted, and I read the book as soon as I opened up the box! The book contains 15 poems of varying styles – some rhyming, some free verse, some light-hearted, some more serious – all about the various creatures that come to visit a watering hole on the African grasslands. Irene spotlights meerkats, rhinos, lionesses, and black mambas, to name a few, but I think my two favourites are the ones Irene opens and closes with, “To All the Beasts Who Enter Here” and “Says Nightjar to the Stars,” respectively. Anna Wadham’s illustrations perfectly complement the playful, spontaneous, and stoic nature of the beasts, too – and of Irene’s text. If you haven’t considered picking this up yet, I recommend you do! Now, then…to my poem! I have to thank award-winning slam poet Zachary Kluckman, the anthologist of Trigger Warning: Poetry Saved My Life, for selecting this poem for inclusion. When I first read what type of book he was putting together and the subject matter – literally, how poetry can save someone’s life – I knew exactly what I was going to write about. About 25 years ago, a very close friend of mine went through an extremely difficult time in his life…and it nearly destroyed him. Fortunately, he found support from his friends and therapy from writing poetry. I hope you like it. I’ve posted audio of my reading of the poem below (sorry about the big head – I can’t do anything about it!) and of course, if you’d like to read more about how poetry can save lives, be sure to pick up a copy of the book, on sale now! in an unintended self-immolation of love and pain. Poetry Friday: New adult anthology! Trigger Warning: Poetry Saved My Life is a poetry collection compiled and edited by performance poet Zachary Kluckman of Albuquerque, NM, the 2014 National Poetry Awards Slam Artist of the Year. I’m very pleased and honored to have a poem included in it – and I just received word that the book is available for purchase! As soon as I learned about the book, I knew I wanted to submit a poem and I knew exactly the story I was going to tell – a true story about a close friend of mine whose life was, indeed, saved by poetry. I hope you like it, and all the other stories, scenes, and vignettes pulled together from all walks of life into this one, single-minded anthology of common ground. The book is described by the publisher thusly: “Here are the sounds of pleasure heralded against shoulders, the uplifted voices and stark tremolos of those who have survived the turmoil and trembling because they found something so deceptively simple – so heart-wrenchingly real”…as poetry. Click on the link for more info, or click HERE to purchase it! And for all of today’s Poetry Friday links, info, and fun, head on over to The Poem Farm with Amy Ludwig VanDerwater!